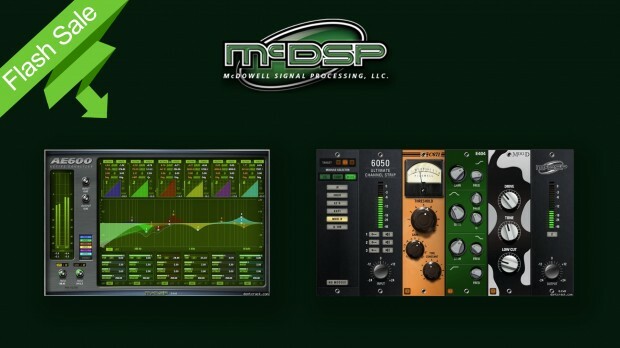 McDSP AE600 and 6050 Channel Strip Flash Sale, from today until Sept 17th. With Native at $49 and HD at only $69, you can save $200+ on each and add these great products to your plug-in arsenal for your mix and mastering needs. The AE600 is the next generation of active equalisation. New and unique EQ modes, independent control of fixed and active EQ bands, and an ultra low latency algorithm make the AE600 the perfect solution for any audio production. All bands are completely overlapping and can use the input signal or selected side chain inputs to trigger the active EQ response. The active EQ bands can be controlled via the response plot itself, or from the text readouts above and below the response plot. The 6050 Ultimate Channel Strip includes all the modules from the award-winning 6020 Ultimate EQ and 6030 Ultimate Compressor plug-ins. Additional modules include gates, expanders, signal saturators, and specialized filters. A module selector panel allows quick auditioning of equalizers, compressors and additional effects. Like the original 6020 and 6030 plug-ins, each new module in the 6050 draws on classic and modern designs over the last four decades. Operation is simple and intuitive, and the sound quality is what professionals worldwide have come to know in McDSP plug-ins. This entry was posted in DontCrack, Plug-ins, Promotions and tagged 6050 Ultimate Channel Strip, Active EQ, AE600, compressors, Equalization, Expanders, filters, gates, McDSP Flash sale, signal saturators. Bookmark the permalink.